'The Donors’ Dilemma' - Did Global Poverty just fall a lot, quite a bit or not at all? This column by Andy Sumner is part of Global Policy’s e-book, ‘The Donors’ Dilemma: Emergence, Convergence and the Future of Aid’, edited by Andy Sumner. Contributions from academics and practitioners will be serialised on Global Policy until the e-book’s release in the second quarter of 2014. Find out more here or join the debate on Twitter #GPfutureofaid. The new data is subject to a whole bunch of caveats. Not least that the full background information on the data that is needed to assess any bias isn’t out until 30 July. For example, sometimes this price data may over represent urban prices if it is largely collected in urban areas (when most of the poor are likely to be rural dwellers) or represent elite consumption rather than consumption by the poorest (e.g. Bordeaux red wine and Peugeot cars in Cameroon’s PPP data was Angus Deaton’s spot in the last round of data). So one should really interpret these data with some caution as the World Bank’s Chief Economist has suggested. Firstly the revisions suggests that half of world’s GDP now comes from developing countries. Secondly, the data for India, where most of the poor live (or did before the revision), is puzzling in itself and worthy of some further probing. Not least because India became the third largest economy in the world after the revisions. Thirdly, beyond India, the world’s poorest people (living on less than US$1.25/day) are concentrated in about 10 or so large and populous countries, most of which had major revisions to their PPP data. Lastly, despite suggestions that the revisions would mark China’s economy as bigger than the US’s by the end of this year, China’s National Bureau of Statistics did not agree with publishing the headline results for China’s PPP. This meant that the data for China had to be estimated by the ICP itself; though it’s a bit unclear exactly how they went about this. What does all this mean for global poverty counts? Various researchers set out to estimate global extreme poverty at the international poverty line of US$1.25/day (formerly the dollar-a-day before previous PPP revisions). But they came up with quite different numbers. The following discussion relates to that definition of poverty, even though many feel it was always too low a line. Indeed, it has been argued that poverty and insecurity may extend up to about US$10/day (see here or here or here). To begin, where does the US$1.25 line come from? 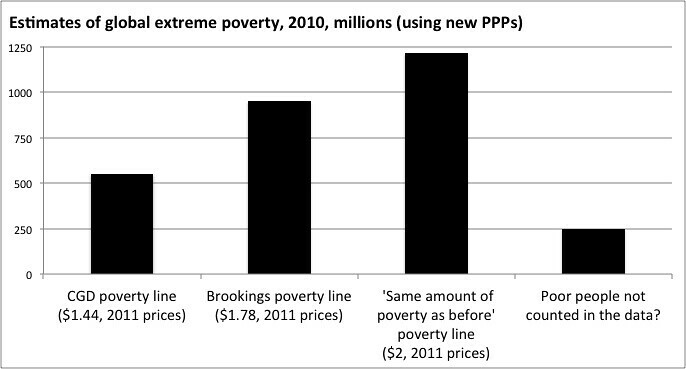 The US$1.25 line is based on the average value of the national poverty lines of the 15 poorest countries in the world. 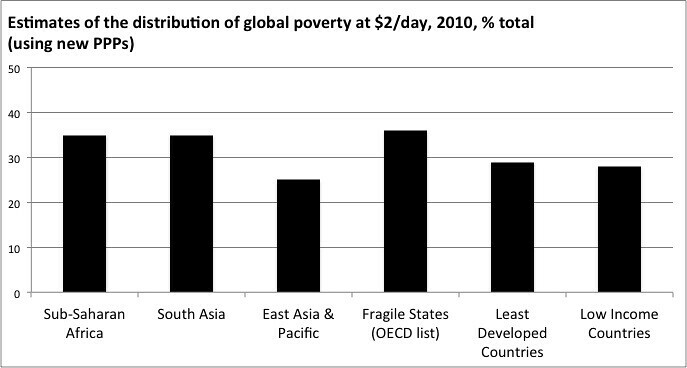 But if you included the national poverty lines of all developing countries you’d get about US$2/day (median) or a higher US$5/day (mean) (all 2005 PPP prices) global poverty line. Thus it is argued that a global poverty line anchored closer to the average for all developing countries might make more sense in the future. And let’s not forget that nothing magical happens when people cross these lines; the numbers merely serve to express the extent of the problem and overall trends. Here are the 15 countries the World Bank used last time: Malawi, Mali, Ethiopia, Sierra Leone, Niger, Uganda, Gambia, Rwanda, Guinea-Bissau, Tanzania, Tajikistan, Mozambique, Chad, Nepal and Ghana. Notice anything about the list? Just an observation – there’s not much overlap with many of the world’s populous developing countries where most of the world’s poor live(d) like India, China, Nigeria, Bangladesh, and DR Congo. So, what happened after this round of revisions to the PPP? It was thought that there were 1.2bn people living under the US$1.25 line in 2010. Yet, depending on the approach you take, estimated global poverty may have changed for that same year either a lot, quite a bit or not at all. The reason for differing numbers is that different poverty lines are used: The crunch is where and how to (re)calibrate that US$1.25 poverty line. There are three approaches (see figure 1). One is kind of logical, one is kind of loyal and one is an alternative approach which is introduced below. The revisions, as CGD notes, were entirely due to the new price data: Estimated poverty fell as a result of prices being found to be lower than thought in India and many other countries. One issue here is whether adjusting a global poverty line for the world’s poorest people by US inflation is a good way to go. It may sound kind of logical though we have been here before when the PPPs were revised last time and Martin Ravallion’s comments on the blog point to that: The problem is that PPPs don’t really mean you can buy the same thing when you are comparing very different income levels and consumption patterns. In short, people in different countries don’t necessarily consume exactly the same things nor do the rich and the poor in the same country. The extent to which it is logical also depends on what you think the line represents. The global poverty line is in US dollars and what someone can buy in the US. So, adjusting by US inflation makes some sense. However, if you think the poverty line should represent or be ‘anchored’ to national poverty lines in poor countries then that might suggest a different approach. That new poverty line means that there are 950m poor (or 870m poor if you change the survey data used in two populous countries – India and Nigeria). Global poverty, therefore, is quite a bit lower than we thought. For instance, in India poverty estimates halved from 400m to perhaps less than 200m poor (how much depends on whether one changes the data). In Nigeria, poverty estimates fell to about 65m (ditto). In Bangladesh they fell to 50m. And estimated poverty in Pakistan fell to less than 20m. One issue is whether the World Bank will use the same set of 15 countries to anchor the global poverty line (unlikely as they have changed) or the new set of the 15 poorest countries (which would push the global poverty line up more to something close to US$1.65 in 2005 prices or US$1.90 in 2011 prices and thus increase the numbers of poor people counted) or it is possible that the World Bank will take a completely new set of countries or line on a different basis. Changing the countries can make a big difference to not only total numbers but the global distribution of poverty: when the World Bank last changed the anchor countries, it contributed in part to the jump in the number of people counted as poor (relative to previous counts). Perhaps the sensitivity of the poverty numbers at all these low lines might mean a higher line would make sense. To their undeniable credit, both the CGD’s and Brookings’ figures are absolutely peppered with caveats and caution. Though such caveats and caution can quite quickly get forgotten when the headlines are so powerful: for example, despite all the caveats the numbers for India are already on Wikipedia cited as, errrmmm…, the official estimates for poverty from the World Bank. Imagine you say nothing is actually concretely different in people’s lives even if the PPPs have changed. This would mean revising the global poverty line to keep the same number of people (1.2bn) under the line before and after the PPP revision. That gives a US$1.72 poverty line in 2005 prices or US$1.98 in 2011 prices – tantalisingly close to an ever-so-neat new US$2/day. The idea is that from the perspective of people in poor countries nothing concrete has changed – most notably national poverty lines did not change as they are in local currency, nor do the numbers of people under those lines. So could US$2 eventually become the new global poverty line? It is likely to resonate like the US$1/day originally did as memorable (which matters a lot politically). The biggest problem with this approach is that it isn’t based on a clear definition of poverty, other than the historical evolution out of the number of people living under $1.25/day in 2005 prices in 2010 when the PPPs were revised. It is sobering just how sensitive the global poverty numbers are to small changes in the value of the line taken (see figure above). That in itself might suggest simply going to a higher line would be better. For example, there are 400m people between the CGD and Brookings’ lines and then another 250m people between the Brookings’ line and a new US$2 line (new PPPs). There are also perhaps up to 250m people who may well be poor but aren’t included in the data such as homeless people and other groups often missed in data collection. Not to mention the 300m people who live in countries with no poverty data (typically regional averages are taken to represent these countries). There are three reasons why all of this matters: first, the numbers do mean that the existing global poverty line will have to be recalibrated – so expect a likely fraught year of debate on between NGOs, think tanks and the World Bank on what counts as poverty. This debate will be given further heat as the goal for post-2015 is to eradicate poverty. Adding to that mix will presumably be major scrutiny of the PPP data by Angus Deaton and others (and expect all sorts of oddities on that when people look closely). Also on the table might be progress towards pushing forward ideas on the consistency of national poverty lines in calories used to calculate national poverty lines or other aspects not related to PPPs. Second, relatedly, in that post-MDG discussion, the UN is aiming to end extreme poverty by 2030 so it would be quite useful to know how many poor people there currently are and what the projections would be by various growth and inequality scenarios. Existing projections suggest that even the most optimistic growth rates won’t be enough and significant changes in income inequality will be needed too. Third, changing the lines actually moves the global poverty ‘problem’ around so even if one says poverty hasn’t changed, it has moved around a bit and thus has implications for thinking about poverty, aid and policy. Crudely put, lower poverty lines effectively ‘Africanise’ poverty because the proportion of global poverty accounted for by sub-Saharan Africa rises. The same is true for fragile states and low-income countries or least developed countries. In contrast, only slightly higher poverty lines in general ‘Asianise’ global poverty and fragile states begin to account for a lower proportion of global poverty. One final thing worth noting is - of course - nutrition, health and education poverty data didn’t change with the price revisions. With the annual multi-dimensional poverty estimates at 1.6bn people last year (a figure substantially higher than any of the monetary poverty estimates above), maybe more attention should be given to these in the forthcoming discussion on estimating global poverty. Andy Sumner, King’s College London and Editor, 'Emergence, Convergence and the Future of Aid: A Global Policy Debate'.